Discharges drums 23 3/4″ diameter x 36″ tall. Patented Control Link™ Rotation System provides 180° drum rotation for complete product discharge. Heavy-duty carbon steel tubular frame. 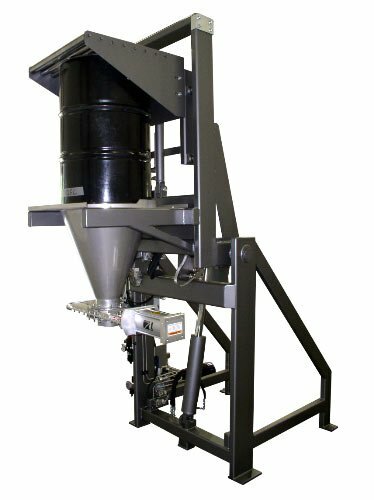 MTS Lift & Seal System™ seals drums to pour cone for dust-tight operation. Seal carriage features non-sparking stainless steel cam rollers on a stainless steel bar track. Custom rolled 304 stainless steel pour cone. All product contact welds ground smooth. 6″ diameter pneumatically actuated Salina Vortex Quantum orifice slide gate. Carbon steel painted with USDA/FDA approved Steel-It epoxy system. Pneumatic controls for intrinsically safe operation. Unit designed for Class II, Division II, Groups E, F, & G.
Self-contained 2 HP air motor driven 2 GPM hydraulic system. Air motor requires 70 cfm @ 70 psi air supply. Pressure switch on drum seal circuit for “automatic” sealing of drums.